On 11 May we began a thirteen day marathon through two missions that put us on seven flights and took us all the way south to the Strait of Magellan. We had been invited to teach, consult, and give flu shots in the Concepción and the Osorno Missions, and that came hard on the heels of doing similar things in the Concepción South, Rancagua, and Viña del Mar Missions. Our visit to Concepción followed by three weeks our previous visit to that city, which had borne the brunt of the 27 Feb earthquake. This time we flew, and a senior couple, the Fischbecks, picked us up and drove us around. We were able to see more of the damage than we had before. There is visable evidence all around of the 10' drop the city fell during the quake. We also had a humorous experience trying to find a hotel called the Tierra Mar, which now is more mar than tierra. We were able to see a little earthquake damage on this second trip. This photos of an office building is typical of the very common damage. See the top level where much has fallen off. Click on the second one to see the damage of the tile roofs. This was everywhere. We came to realize that tile roofs are easily destroyed in an earthquake. The corrugated metal roofs fared well. We spent two days attending zone conferences in the Concepción Mission and then flew back to Santiago for a two-hour lay-over, only to fly very far south again, this time to Punta Arenas (Sandy Point) on the Strait of Magellan. (A veteran of traveling to the south of Chile had told us that our schedules needed to be flexible for traveling in that part of the country.) That flight was 3 1/2 hrs. ; to give you some idea of the distance covered, we went from latitude 33.5° to 53.5° south, approx. the distance between Salt Lake and Atlanta. When we got to the airport we had problems with the medications that we were transporting. We didn't have anything official to show why we were transporting hundred of syringes with vaccine in them. They would not let us board the plane without something official. Pres. Lovell had an idea. He had them copy Dave's license and also his health insurance card (go figure--it just looks official I guess) and then he got behind the counter and typed out a very official looking document saying who Dave was and what he was doing. (Pres. Lovell is an attorney.) They bought it and we were on our way. This area is known here as 'Fin de Tierra,' or 'The End of the Earth', because it literally is at the bottom of the American Continent. President and Sister Lovell, of the Chile Osorno Mission, met us there and we spent eleven days traveling with them. I believe that the Lovells have one of the more inaccessible missions in the world; for example, you can only get to Punta Arenas by boat, airplane, or by driving for many hours through Argentina. The rest of their mission requires a great deal of flying and /or taking ferries. That is why eleven days were set aside for five zone conferences. The other cities we had conferences in were Coyhaique, Puerto Montt, Osorno, and Valdivia. This is a photo of Punta Arenas and the Strait of Magellan. It looks beautiful and calm but it is treacherous by ship and many, many have lost their lives. However, apparently rounding the Horn is even worse. I love the colorful homes in these cities. Punta Arenas is more cosmopolitan than most of Chile. I could buy shortening and brown sugar in the stores there. There have more importing and exporting from the US. We were occupied by our duties almost all of that time. We did, however, get to see some of the sites from a distance, at least. This area of Chile has some of the most stunning scenery I've seen, even in late autumn. I'll try to describe it: The more northerly part of the Osorno Mission in divided into two regions (states): Los Rios, and Los Lagos. This is, as it sounds, an area of rivers and lakes, and VOLCANOES. It rains an incredible amount here, and that makes it quite verdant. The many, many lakes are idyllic. The area was settled by Germans, and it retains its German architecture and character - but not language. Then there is a large inhabited island called Chiloé. It is on the Pacific, and it gets approx. 13 feet of rain annually. Further south from Chiloé the country is simply a maze of islands and deep fjords. The southernmost regions of the country are Aisén and Magallanes (Magellan). Together, these are known as Patagonia. It is one of the few remaining truly wild areas in the Western Hemisphere, on a par with northern Alaska and the Amazon Basin. Patagonia has nearly a dozen national parks. These are full of glaciers, rugged peaks, rivers and waterfalls, active and extinct volcanoes, and pristine, old-growth forests. These are the Hamiltons, a senior couple serving in the Osorno Mission as the office couple. Before their mission, they already owned a wonderful home on the shore of Lake Llanquehue. They took half a day to show us the lakes area including their home. The town of Llanquihue and the surrounding towns are are strongly German. There are three volcanos on the shores of this lake but due to cloud cover, we could not see them. These are salmon farms in the water. I was really interested in this marvelous carving showing the pioneers of the area. The Germans moved into this area which was uninhabited at the invitation of the Chilean government. They had some tremendous hardships. many, many of the buildings were very German looking such as this one. When we were in Coyhaique it had the appearance of a Vail, set down in a narrow Alpine valley. Puerto Montt and Osorno were towered over by the 20,000 ft, snow-covered Volcán Osorno. The drive to Valdivia follows a 'new' valley created by the 1960 earthquake, the strongest ever recorded in the world. Puerto Montt has a beautiful harbor. Punta Arenas looks a little more barren; mostly a windblown grassy steppe, but wildly beautiful. This time of year the days are very short and there's quite a chill in the air. In fact, we wore winter clothes throughout our tour of Misión Osorno. This is Puerto Montt. This view is taken from our hotel room. These are shots of Coyhaique which is up in the Andes. The scenery was stunning with the fall colors which do not show much in these photos. This is Pres. and Sis. Lovell at the cute bed and bnreakfast in Coyhaiqui. We did not come on this mission for the purpose of touring, so we are not disappointed that we didn't get to see more of the scenic beauty. We were surprised when we found out that our calling would require so much travel, especially this early into our service. It is simply an unanticipated bonus - alright, a blessing - that we get to see these world-class places. We're not complaining. The big reason we've been gone so much is to get the H1N1/seasonal influenza vaccinations given before it gets further into the flu season. Swine flu was pretty common, and severe, last year amongst the missionaries here. Now that that task is pretty well done, we shouldn't have such a hectic schedule again until next year when we repeat the process. If we then can get started a little earlier it will put us into the 'deep south' at a better time of the year for traveling. So, we've already traveled two-thirds of the length of this absurdly-shaped, two-dimensional country. We can't claim to have traveled its breadth, since it has none. What a variety of landscapes we've seen, already. However, the greatest rewards have come in meeting nearly all of the incredibly dedicated young missionaries and feeling of their testimonies and spirituality. What a privilege it is for us to be able to work with so many wonderful young sons and daughters of God. The future of the Church is going to be in good hands! We've also been able to meet 7 senior couples assigned to the missions, out 'working in the trenches,' and to a person , they are exceptionally happy people, loving what they are doing. We've stayed in the apartments of some of them. We've also slept and dined in ther homes of half of the mission presidents and their wives. That, also, has been a great privilege, as we've visited in the evenings and shared long drives on the road, airplane flights and restaurant meals. It was a great experience getting to know these special servants of the Lord, feeling their testimonies, and seeing their love for their missionaries. During our travels, the responsibility of area medical advisor continued. A lot more of it had to be carried out over the phone, whose battery was difficult to keep charged because of the volume of calls. There still were missionaries in Santiago, and all of the other places, getting sick, being bitten by dogs, needing hospitalization and/or surgery, or referral to specialists. We have a senior hermana missionary who works in the area office, and who also is a retired RN. She was a great help to us, as we co-ordinated many of these things over the phone. The travel was nice. But after being gone for four out of the preceding five weeks it was nice to return to a more orderly, organized schedule and a place where we have all of the things we need to do our job. 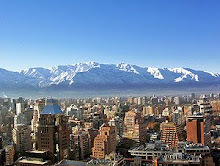 It was also nice to get back to our 'home away from home', the lovely city of Santiago. With its vastness, traffic, and pollution, it's still a very beautiful place in which to live; at least, all of the parts we see, even with the trees now mostly bare. On our computer desktop we have a function that gives us a continuous readout of the weather in Santiago and also in Fillmore, Utah. At the time of our leaving, two weeks ago, the temperatures were pretty close to the same at any given time. During the time we were gone those temperature swithced to being warmer in Fillmore than in Santiago. It is really hard to get used to thinking of May in the autumn and November in spring. We are back to seeing sick missionaries in the clinic at the area office (you wouldn't believe how many of them were waiting for our first two days back). We continue to see and treat missionaries, advise mission presidents regarding more difficult cases, give immunizations in the MTC, review medical reports on missionary applicants from Chile, and work on a number of special projects. Suzanne has resumed her piano teaching. We will still be scheduled to visit the missions, one at a time, to teach health-related topics in their zone conferences and consult in person with missionaries who live too far from Santiago to come into the area office. We will continue to enjoy playing a useful role in this great missionary work.